Welcome Milkweed Growers and Sellers! The goal: Connect milkweed buyers with milkweed sellers. Milkweed is an essential plant for the monarch butterfly. Thank you for making it available to the general public. Thank you for being a milkweed source for buyers. Milkweed plant buyers are increasing daily. Buyers will be able to quickly find milkweed that you are selling and then go to your website to find information and make a milkweed plant purchase. 1: Please complete this google form. The image you choose can be any size. Larger is better. I will publish it at a maximum area of 500 pixels. If you are sharing a file like an image for your business then please include other identifiable information about your business in the contact form below. That way I can be sure to link the correct image to your business. After you upload your company's image simply add your business name so I can easily associate your image to your business. State specific exposure. Visitors see all the sources for milkweed plants in their state in one place. Be seen and have links to your nursery like these Texas milkweed growers. Social media exposure helps customers share the good news about discovering milkweed plants for sale. Unique Pinterest pin on the Milkweed Sources board. 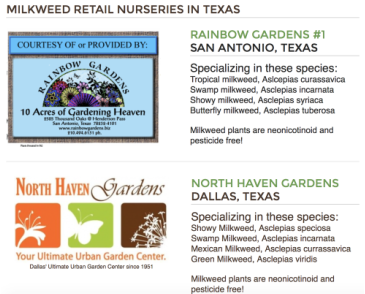 Links to your business webpage will take customers directly from Grow Milkweed Plants to your website. Having customers contact you directly allows for business' and customers to communicate directly. Direct communication makes for a better experience for everyone.